The Soo-Strongs trail is a snowmobile trail between Sault Ste. Marie and Strongs, in Michigan. It is located in the Upper Peninsula, or UP (pronounced You Pea). It is mainly forested area and goes directly through the small town of Brimley. It was once a railroad track so it is very flat. It may not require a fat bike, but there are places that fat sure comes in handy. The stability of 4 inch tires was appreciated on the areas with sand, loose gravel, or small rocks. The day was Saturday, August 29, 2015 and the weather was overcast and an ideal 65 degrees. This was my second experience on this trail. Two years ago my daughter and I rode the 10 miles from Brimley into ‘The Soo’, which is the local name for Sault Ste. Marie (pronounced Soo Saint Marie which is French for the River of Saint Mary). That ride was done on mountain bikes with regular 2” wide tires and is one of the things that convinced me to get a fat-bike. Our plan was to start at Sault Ste. Marie in the late morning, eat lunch in Brimley, and finish at highway 28 at Raco for a total of about 20 miles. We are familiar with the area because we have relatives nearby that we visit every summer. We live in the Detroit metro area so we are actually ‘trolls’, because we live under (South of) the bridge at Mackinac (pronounced mac-i-naw). Our ride started at the Soo near the Ashmun Bay boat launch. The picture shows my brother-in-law’s custom bike carrier, the hydroelectric canal flow control on the left, and the international bridge to Canada in the background. The next picture is the trailhead. My bike is an Origin8 Crawler and hers is a Framed Minnesota 1.0. We have pretty basic equipment, notice the fancy Gatorade water bottles. I like the Nuvici 360 and the way it shifts, but it lacks really low and high gear ratios. I miss having a granny gear. It also makes the Crawler a bit heavy. The Origin8 website declares it at over 40 lbs. Before long we were out of town and near the Algonquin cross country ski trail. 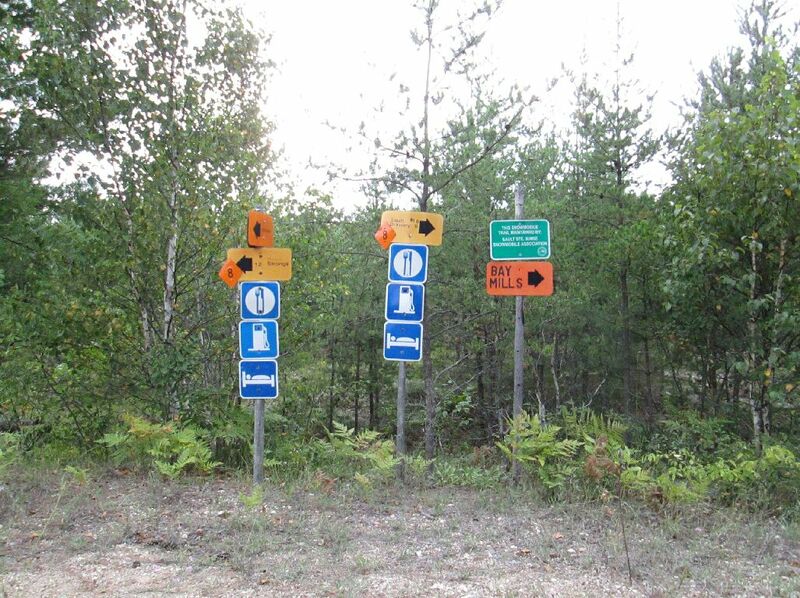 The ski trail is open to bikes in the summer and it crosses the Soo-Strongs trail in several places. We took the ski trail as far South as it goes, because it is not as sandy. This part of the UP is very sandy. We got back on the Soo-Strongs trail at what seems to be a dry riverbed. It is actually a pipeline crossing that four wheelers have churned into powder. It can be seen as a large X on Google Earth. After that, the ride was awesome. The scenery is gorgeous with wetlands and forests. There is also a section where the trail is black gravel and smooth as glass. We had lunch in Brimley and then continued. You must travel on paved roads at least a mile to continue the trail. We rode a couple more miles on W Irish Line Road because part of the trail was so overgrown. Once back on the trail we were met with three downed trees from a storm a few days before. We also saw a beaver dam. Eventually we made it to the town of Raco, if you can call it a town. Not much there. Unfortunately there are a couple hundred yards of private property, whose owners aren’t so trail friendly, so you have to ride on M28 for a short time. That is where we called our ride to come pick us up. I highly recommend this trail to anyone. You can ride just about any distance you want because it crosses many roads and you can get on and off easily at many places. Check it out on Google Earth to plan your drop off and pick up points. It is very scenic and not technical. But there are mosquitos and the occasional big fly to fight off. Don’t forget repellent. It is close to Lake Superior and Tahquamenon Falls. Check them out too while you are there. Be advised that there are some long sections that are very soft and sandy between 5 mile road and the Soo. My only regret is accidentally leaving my camera in low resolution. Next summer we are picking up where we left off and plan to go right past Strongs all the way to Eckerman. I’d like to hear from anyone who has taken it even further West.